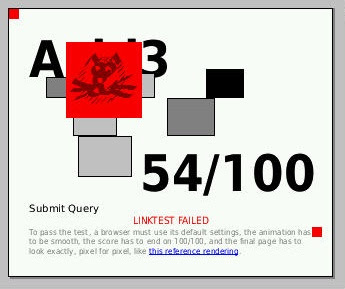 Research in Motion’s BlackBerry Browser scores a 54/100 on the Acid3 test. While not perfect this is respectable as it actually beats out Firefox 2 and IE8. In comparison to other phone browsers, it beats out Opera Mobile, but is right behind MobileSafari and Opera Mini. Worth noting is that the BlackBerry Browser doesn’t actually even fully pass the Acid2 test, but comes close, and due to the limited spacing is likely to intentionally not be fully compatible.